NEW Design Options-A Different Design for Each Semester! 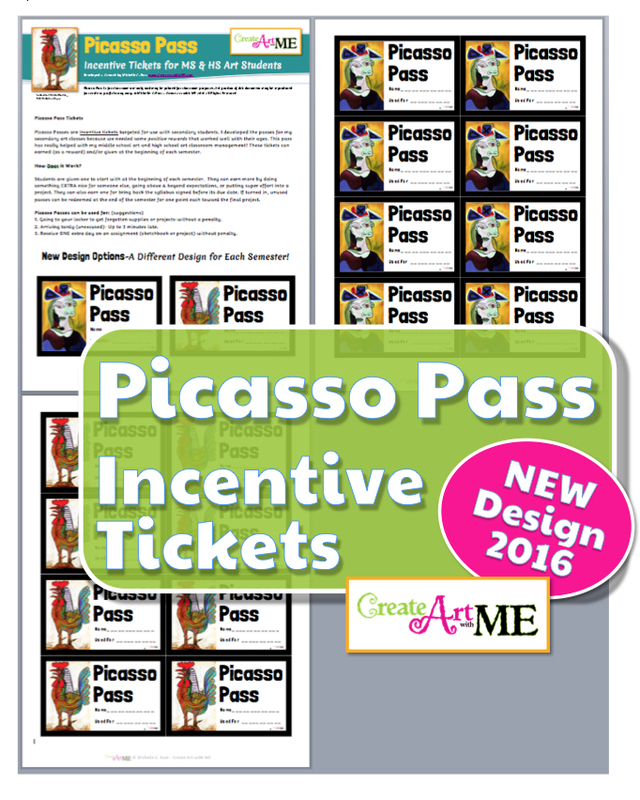 Picasso Passes are incentive tickets targeted for use with secondary students. I developed the passes for my secondary art classes because we needed some positive rewards that worked well with their ages. This pass has really helped with my middle school art and high school art classroom management! These tickets can earned (as a reward) and/or given at the beginning of each semester. Picasso Passes are incentive tickets targeted for use with secondary students (6th-12th Grade). I developed the passes for my secondary art classes because we needed some positive rewards that worked well with their ages. This pass has really helped with my middle school art and high school art classroom management! These tickets can earned (as a reward) and/or given at the beginning of each semester. Students are given one to start with at the beginning of each semester. They can earn more by doing something EXTRA nice for someone else, going above & beyond expectations, or putting super effort into a project. They can also earn one for bring back the syllabus signed before its due date. If turned in, unused passes can be redeemed at the end of the semester for one point each toward the final project. This is just my way of using them, feel free to modify to fit your classroom! 3. Receive ONE extra day on an assignment (sketchbook or project)-without penalty.